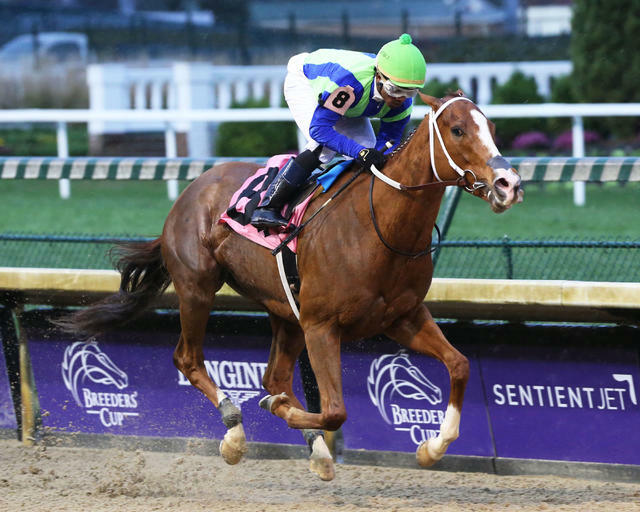 Kirk and Judy Robison’s Vertical Oak repelled the bid of Awestruck to win the $100,000 Dream Supreme Overnight Stakes by 2 ¾ lengths Sunday at Churchill Downs. Ridden by Ricardo Santana Jr., Vertical Oak pressed the early pace set by Student Body through an opening quarter mile in :22.28. At the three-eighths pole, Santana took command of the race when Vertical Oak rallied three wide and held off late-running Awestruck to complete the six furlongs in 1:09.53. Trained by Steve Asmussen, Vertical Oak returned $4.60, $2.60 and $2.10. Awestruck, ridden by Brian Hernandez Jr., paid $4.40 and $2.80 while third-place finisher Dream Pauline returned $3. Vertical Oak now has eight wins through 20 starts, including three victories beneath the Twin Spires. The 4-year-old filly by Giant Oak has amassed $716,565 in purse earnings. Lucy N Ethel, Astrollinthepark, Thirteen Songs, Swing and Sway and Student Body completed the running order. With dark days Monday and Tuesday, live racing will resume Wednesday at Churchill Downs with a first post of 1 p.m. EST. There is a Single 6 Jackpot carryover of $31,367 on Races 5-10 and a $21,311 carryover for the Super Hi-5 in the finale.